The standard issue uniform for American World War II soldiers consisted of a basic wool uniform, a field jacket or wool coat, leggings, and various other pieces. Most of the clothing was a light to medium shade of olive drab. Some soldiers even wore items from home—either because they needed to, or because they desired to be more stylish. 2nd Lt. William J. Schereck and his division fell into the latter category. Schereck served from 1943 to 1944 with the 143rd Infantry Regiment, 36th Infantry Division. The officers in his unit privately ordered horsehide Hercules leather jackets, selected from the Sears catalog and shipped directly to the field at Monte Cassino, Italy. The officers kept their jackets blackened and shined, proudly wearing them as part of their field uniform. 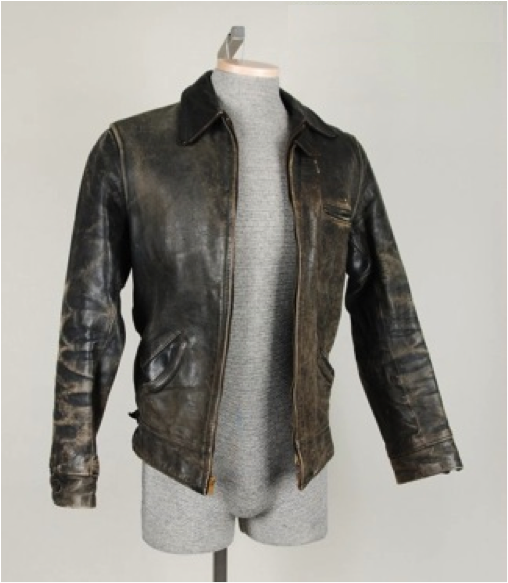 When 2nd Lt. Schereck donated this leather jacket to the museum, our curator was astounded by the jacket’s background, and even questioned the origin. It was highly unusual for privately purchased pieces to be shipped directly to the field during a campaign. It seems that 2nd Lt. Schereck was a soldier with cultured taste, as he also donated a book of self-authored poetry along with his jacket. And not of dying men. We want to do again. Not of what has gone by. Where brave men do not die. There are things more cheerful yet. Things we want to forget. See more World War II artifacts for yourself at the Wisconsin Veterans Museum.